The major danger when using shaders or powerful liners for thick strips is the blurring of paint. 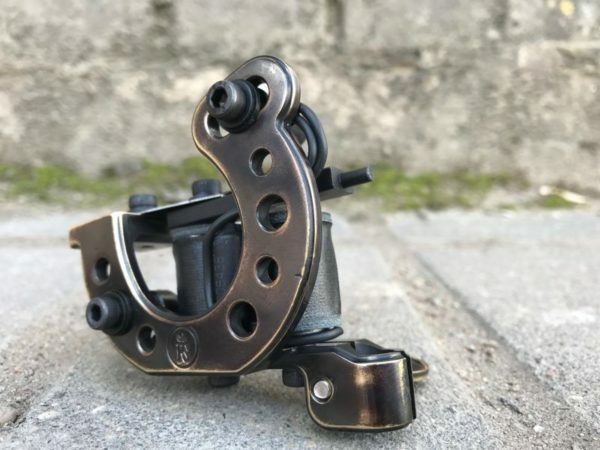 LUCKY TrueLiner Bronze Tattoo Machine works just amazing, combining a powerful and accurate impact leaving the ink at the right depth! This liner matches for 9-18 Rl needles. It is designed for people, who leisurely and at ease, just pulling the skin with one finger, make thick strips in one pass. 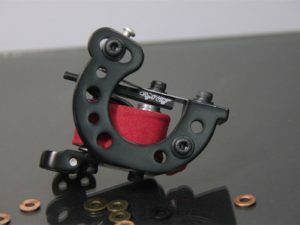 The unit with perfect coils of 26 mm and 9 wraps is good for needles from 9 and above. This device gives an unsurpassed stability and confidence in holding clear thick lines. 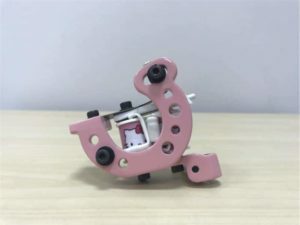 It is designed for single-pass operation with skin. Artists, who met the problems with the contouring of thick lines working with the other items will forget about their old machines, when start working with this one. Bronze frame makes the tool pretty heavy – 200 grams. However, exactly thanks to this material the lifespan of the machine is extremely long. This long-stroke tool runs at frequency of 135 Hz and 6,6 V voltage.